Patrick Scanlon spent years as a brewer, but now he’s managing partner of the Royal Oak Brewery, which he co-owns with Drew Ciora. The brew pub offers six to eight beers on any given day, such as Northern Light and Fourth Street Wheat. The brewery opened in 1995 and has grown every year since, with $2.3 million in revenue last year. Their most popular beer is Royal Oak Red, a malty, full-bodied ale. Popular store-brand beers often contain more than 100 ingredients, Scanlon says. But the Royal Oak Brewery uses only four: malt, water, yeast, and hops. Michigan’s wineries and breweries are enjoying double-digit annual growth as demand rises for locally produced goods. Not far behind: a new local industry distilling brandy, gin, rum, and whiskey. Michigan’s 70 microbrewers and brewpubs saw state sales jump 18 percent last year to 108,080 barrels, up from 981,807 in 2006 (one barrel equals 31 gallons of beer). During the same period, overall beer sales dropped by 0.6 percent to 6.6 million barrels. Michigan-brewed beer still accounts for just 1.6 percent of all beer sold in Michigan, but home-brew sales have more than doubled since 2003. 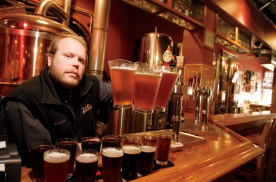 A 1991 law that opened the way for new microbreweries has fueled Michigan’s beer resurgence. By the late 1980s, the industry had all but disappeared from a hardy beginning. In the mid-1800s, there were about 40 breweries in Detroit, many founded by German immigrants. One of those immigrants was Bernhard Stroh, who founded Stroh’s Brewing Co. in 1850 in Detroit, which grew to be one of the largest U.S. brewers before being sold a few years back. By comparison, Michigan’s 40-year-old wine industry is further along and has a larger following. State-produced wine sales jumped 14 percent in 2007, while total wine sales in Michigan were up just 3 percent. Last year, per-capita wine consumption in Michigan hit its highest level since 1988, according to the Michigan Liquor Control Commission, averaging 1.87 liters per person (or about 2.5 bottles). On the wine front, business is booming. In 2006, Chris Baldyga and Cornel Olivier bought an old 58-acre winery in Traverse City on the Old Mission Peninsula and rechristened it 2 Lads Winery. Last fall, they produced 240 cases of 2 Lads Rosé — the largest production to date. But wineries aren’t standing pat. Spirits consumption rose to 1.52 liters per person in 2007, the highest level since 1990. That growth is due, in part, to wineries such as Black Star Farms on the Leelanau Peninsula, which recently began producing its own spirits, including 80-proof pear brandy, apple brandy, and grappa. They also operate the Leelanau Cheese Co.